The New Zealand Transport Agency is proposing to build a new road near where I live. This coming Saturday is a general election in New Zealand, so I emailed the candidates for my electorate and the neighbouring one to check what their views were. Here are the responses I received, which I'm publishing in the hope that other people might find them useful when deciding who to vote for. In each case, I first looked for an email address for the candidate on the party website, and if I couldn't find an address listed for the candidate there, I tried googling for <candidate name> <party name> email . In a couple of cases I failed to find an address for a candidate, which I find disappointing. I'll keep it brief as you're probably rather busy this week, but I was wondering what your views were on the proposed Petone - Grenada link road, and what you would do about it if elected? I sent most of these on Monday night NZ time (I was actually in Buenos Aires airport with several hours to kill), and I'm writing this early Thursday evening, so in most cases the candidates have had three working days to respond. I was emailing from my phone and managed to truncate Trevor Mallard's email address, so that email bounced, but I got home to find a form letter from him which explicitly addressed the link road, so the quote below is from that. I also discovered while compiling this post that I'd missed two candidates - I've emailed them and will update this if I hear back, but note that they haven't really had a chance to respond yet. Briefly, I am supportive of the road. It will reduce congestion on the way to and from Wellington and also Tawa/Porirua, increase resilience, and help drive economic growth in the valley and wider region. It has a benefit cost ratio of 4, meaning for every $1 invested, there are $4 worth of benefits. It is supported by the Hutt City Council and also has widespread support in the community. Funding decisions and timelines are over to the NZTA. What I can do as local MP is encourage them to get on with it, make sure that locals are consulted properly about the exact route that the road takes, and their concerns are heard, listened to, and acted upon. That's what I intend to do if elected. COPELAND, Gordon Conservative I support both that road and the cross valley link and will lend them my support if elected. The response I've received to the Petone-Grenada link after door knocking Korokoro/Petone residents has been overwhelmingly negative. Locals don't want increased traffic on The Esplanade and don't want to destroy the beauty of the Korokoro valley. I agree with the Mayor that the Cross-Valley Link is a much higher roading priority for the Hutt Valley, as it will reduce congestion and improve travel times. I'm committed to an assessment of roading priorities in the region, with a view to funding upgrades on SH58 as well as the Melling and Haywards interchanges. PARORO, Mataroa New Zealand First Party I'm not on favour of the Grenada link and will not support it. However I will support the cross valley link if elected. Support Petone-Grenada link road. The region needs it. Some questions as to where it cuts through i.e. folk in Takapu Valley not that fussed. Process for consultation has been shoddy. I've attended the local meetings and it looks as though NZTA will have to go back to drawing board as to where it cuts through as those people potentially affected have not had adequate information. I am afraid I know very little about the project and as such it would be imprudent to comment in any way. Party policy is that roads and other infrastructure is, clearly, vital for economic development - however blanket policies on 'more roads - no more roads - more rail' etc are more about ideology then practicality so any and all proposals need to be dealt with on a case by case basis. The Greens are opposed to any more new motorways at a time when traffic volumes are stagnant. We think that fuel prices will rise significantly in the near-mid future, as peak oil production is reached, further depressing traffic, and making new motorways a waste of resources. We would prefer to invest in substantially improving our public transport networks, investing in road upkeep and in new cycling and walking routes. The main advantage I can see to the Petone-Grenada link is in earthquake resilience, as it provides a transport route between the Hutt and the Karori-Plimmerton area. While this is a real advantage, it might be cheaper to invest in strengthening SH58 over the Haywards instead, to provide the same options. So in short, both I and the Greens are opposed to this road. If elected, I would review the case for it (road volumes, cost, earthquake relience, impact on residents and environment), and unless it really stacked up, I would try to have it cancelled. Accepted GSoC students were announced on 21st April, but I was away on holiday last week, and have only just had a chance to write up a blog post about this. We received 30 student proposals for Xapian this year, and Google allocated us six slots (the same as we had in 2012). We had four particularly strong proposals for the "Learning to Rank" project idea, so we decided to create a second project adding more algorithms, to complement the project sketched out in our ideas list. Sorry to those we weren't able to select this year - we had to make some difficult decisions during the selection process, and we really appreciate the time you spent writing your proposal, working on patches, and on the rest of the application process. We'd encourage you to remain involved with Xapian, and to apply to us again next year if you're still eligible for GSoC. If any applicants would like some more specific feedback on their applications please just come and ask us. In the above list, italics indicate ideas or parts of ideas which were suggested by the student, rather than coming from our ideas list. As in 2012, the most popular ideas from our suggested ideas list are those with the closest connections to Information Retrieval theory. I think the clustering idea also seems very accessible, which is why it's been so popular (it was only added to the list shortly before student applications opened, as we'd already seen signs that "Learning to Rank" and "Weighting Schemes" were likely to be very popular). There's also a wider spread in quality for the clustering proposals (perhaps also due to the accessibility of that idea) so don't despair if you're a student who applied for a clustering. And generally, if we have more than one great proposal based on the same project idea, we may accept more than one of them - we don't want to duplicate effort, but it's often possible to adjust the scopes to produce projects which don't overlap. 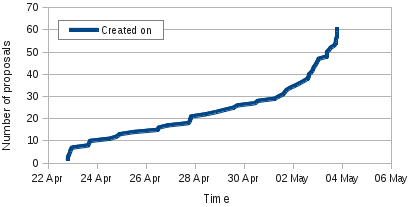 Student applications for GSoC closed a few hours ago, and here are some initial stats on the proposals we received for Xapian (for comparison, see my blog posts for 2011 and 2012). If you're an admin or a mentor, you can produce a similar graph for your own org(s) - just download this OpenDocument spreadsheet and follow the instructions inside. Of the 31, 18 were submitted in the last 12 hours, with the latest submission a rather brave 99 seconds before the deadline. The total number is lower than the 42 and 41 we received in previous years, but in a quick skim through I didn't see anything we'd immediately discount as a spam proposal and mark as invalid. So that 31 is more comparable with the numbers after removing spam from previous years (which were 33 and 30). 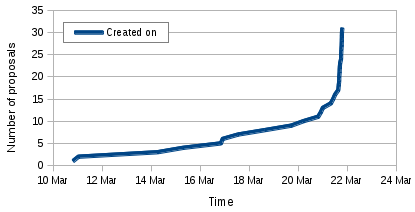 I suspect the improved quality and the even more marked spike as the deadline nears may be due to the new requirement that students upload proof that they are enrolled before they can submit a proposal. 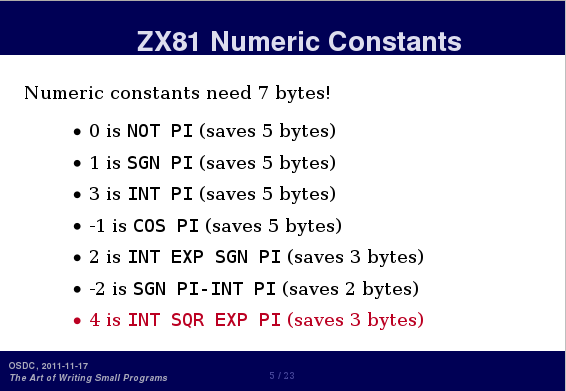 (Of course that should be INT SQR EXP PI/INT PI * PI * R ** INT PI ). Ana blogged a similar graph last year if you want to compare. It looks like the total is down a little (though I'm not sure if the figure of 81 from the text, or ~68 read from the graph is correct for last year) - this is likely at least partly due to the number of proposals each student can send having been reduced from 20 last year to 5 this year, which should have reduced the number of low quality proposals. The timeline this year is later, which may have also had an effect.